Less than one year since we moved into our new home in Chicago’s West Loop, we’re excited to announce that our office has achieved LEED Certification at the Gold Level. The U.S. Green Building Council’s Leadership in Energy and Environmental Design (LEED) certification for Interior Design and Construction (2009 Edition) recognizes high-performing green building spaces that are among the best in their class. We’re proud to be among the best – Illinois was recently named number one in the U.S. for LEED certification. There are more than 400 LEED certified projects in Chicago alone. 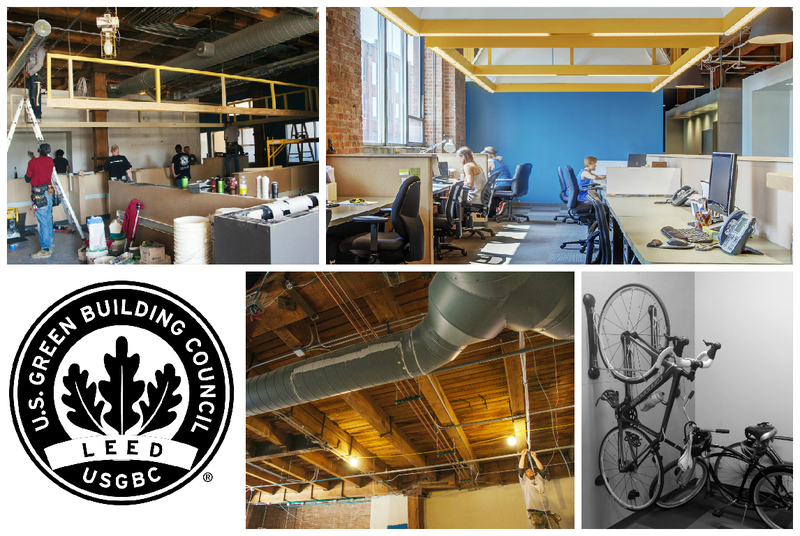 Here are just a few ways we improved our office space at 322 S. Green Street to achieve the certification. Our efficient lighting design reduced the total wattage used in the space by 36 percent. It includes a mix of high-efficiency fluorescents and LEDs. In addition, 97 percent of eligible new equipment and appliances are ENERGY STAR® rated, including our commercial grade refrigerator and dishwasher. We were able to earn three points under in Measurement and Verification category by negotiating a lease structure with Urban Innovation, Ltd., our building owner, in which we pay for our own electricity usage. This ensures that we stay motivated to monitor our usage, avoiding a ‘split-incentive’ challenge, which can exist when building owners are responsible for paying for tenants’ utility costs, and tenants don’t have a clear way to monitor their usage. Following the mantra that the greenest building is the one that doesn’t get built, we worked with Perimeter Architects to reuse more than 62 percent of existing nonstructural interior elements in the space. Due to mindful coordination provided by our Construction Manager, Urban Innovation Construction Services, nearly 90 percent of our construction waste was diverted from landfill and recycled. Perimeter Architects helped us specify low-flow fixtures which allow us to use 38 percent less water in the space than we would with standard fixtures. We installed dual flush toilets, high-efficiency showerheads, and pint flush urinals. To achieve the LEED credit for bike storage, we needed to provide six bike racks. We have 26 bike racks inside the building, and we procured a city bike rack outside the building. We like to think the certification is yet another example of how we “walk the walk” and apply our mission of smarter energy use for all in everything we do, including how we design and use our office space. To learn more about LEED certification, visit the USGBC website.